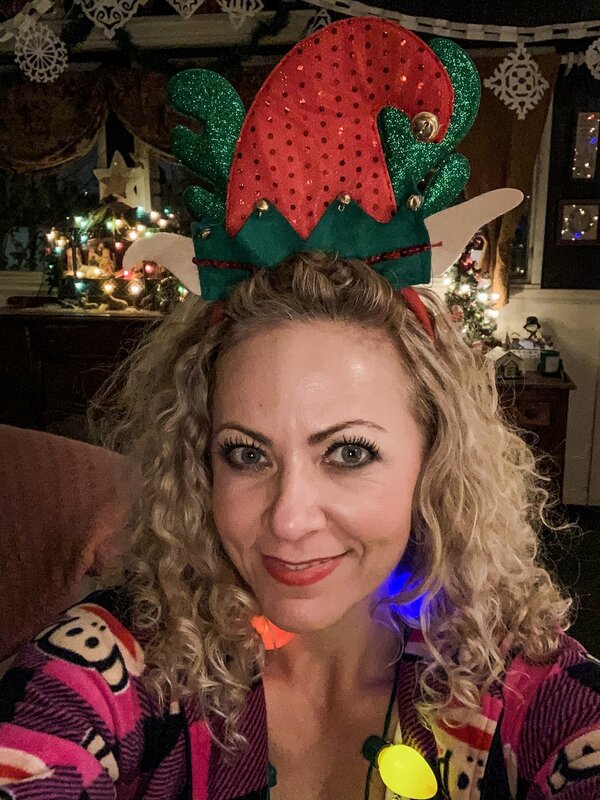 Christmas Bunko is a tradition in it’s own and part of my life with a dozen women for over 13 years now. It is our regular bunko game elevated. My friend Kathy hosts every year and her joy for Christmas can be seen and felt in all that she does. Her house decor, to gifts she selects for us, to crafts we exchange. This group of women is warm and caring and makes me feel appreciated when I see them. I am very different from them all in not being a mom, so sometime I think they don’t know what to do with me, but they are amazing to support my passions never the less. Being around women that say they love you, that you are pretty and ask you about your life is fulfilling in many levels and I am luck to be part of two groups of women that do that. 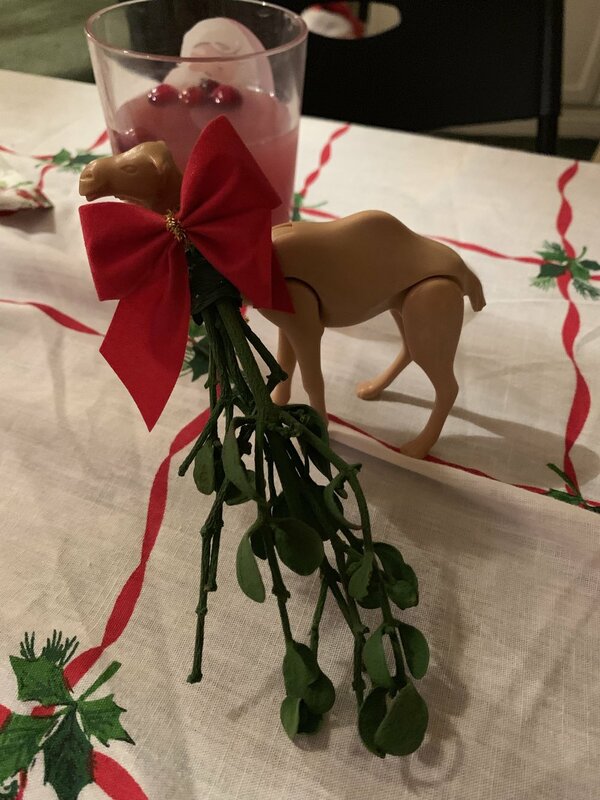 Starting traditions with women is a good way to bond and develop friendships that will carry on for years and hopefully this post inspires and gives some ideas by sharing how we take time out during a holiday season. It is a dice game with 12 women and 3 dice per table. 3 tables of 4 players partnered up and 2 rounds of 1-6. We play for each # on the dice from 1-6 and then again. Object of the game is to get bunko, 3 dice with the same # that you are rolling for. Ex: rolling for 1’s you try to get the # 1 to come up, and count as many as you get. Totaling your score with your partners at the end of that round determines your win or loss. If you get 3 - 1’s that is bunco and one with most bunkos wins. Throughout the game you change partners and tables so it makes for a fun and interactive time, as well as competitive. Some groups play for prizes/gifts and some for cash. First 3 of any # to be rolled when we start is considered crowns, and all night when anyone rolls the 3 #’s they get 5 points and the crown to wear. End of the night, one with the crown on wins. There is most rounds won, most rounds lost, 50/50 (6 wins/6 losses) and boobies (nothing so everyone’s card is put into a drawing for one winner). Hostess each month will pick a theme for gifts that she plans to buy for 6 winners. In addition she can pick the same theme or different theme for an optional gift exchange. Only those that want to participate bring a gift in that theme and exchange with others that brought one. This gift is around $10. We call this under the chair gift. 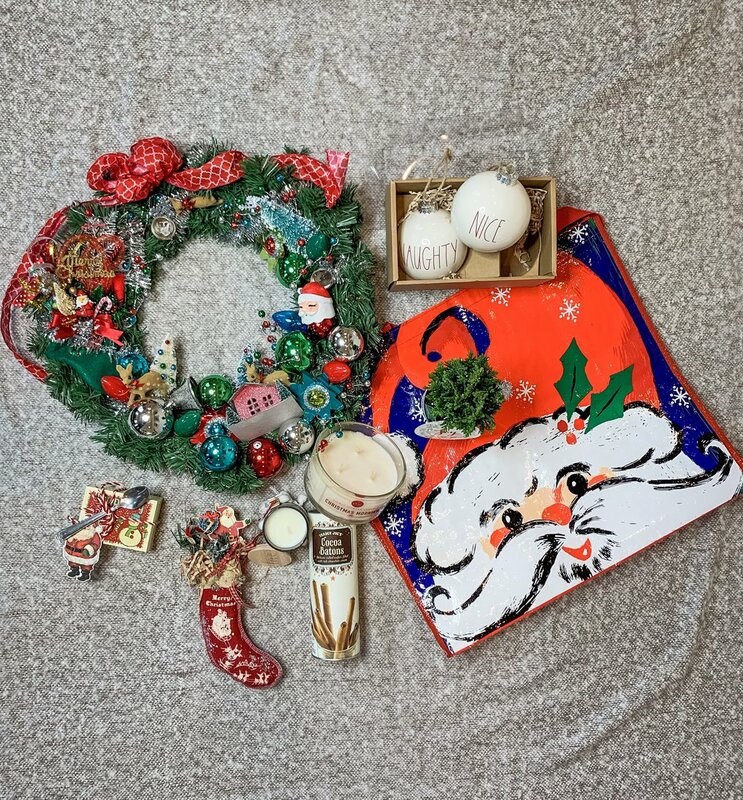 Example of themes have been favorite beauty product, fall, valentines, bbq… December theme for under the chair is ornament, or holiday item and I won the naughty and nice ornaments. 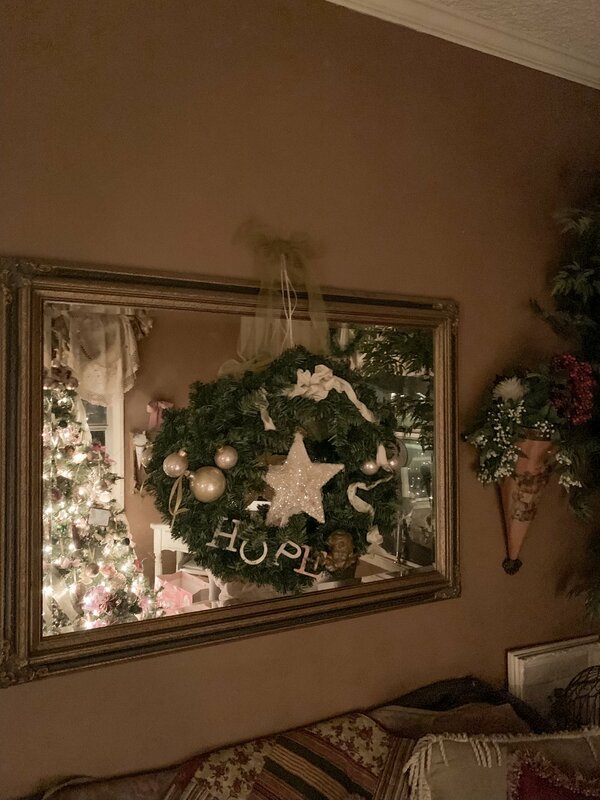 Bunko gift prize was the wreath. Other items are crafts or tokens some ladies share with each other as a little thank you. 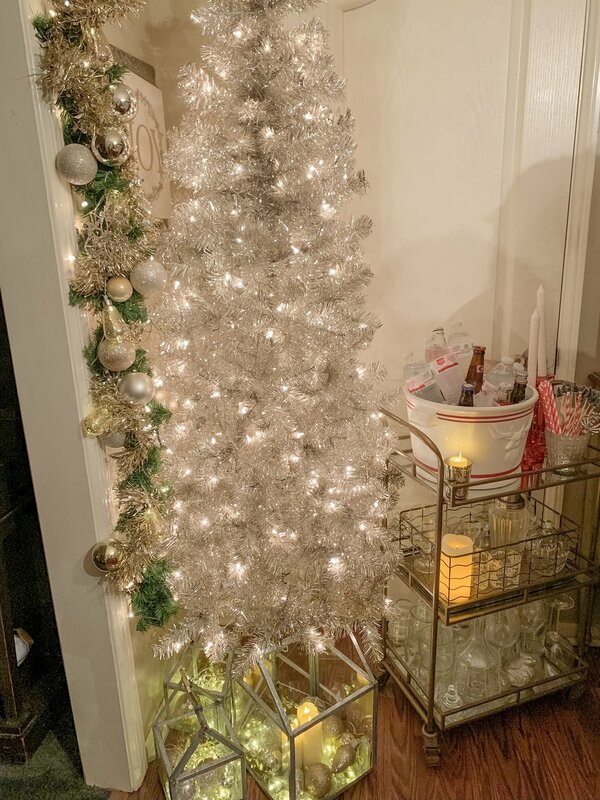 For the group I borough my Christmas tree crafts (click for post) and in turn from others received cookies, hot cocoa, minis Christmas tree and a candle. Each month optional under the air gift is really it and a hostess gift which is of course individual preference and also optional. For Christmas bunko we each bring an appetizer or dish for a potluck style dinner. It is a longer evening and we spend an hour socializing over dinner before we play. 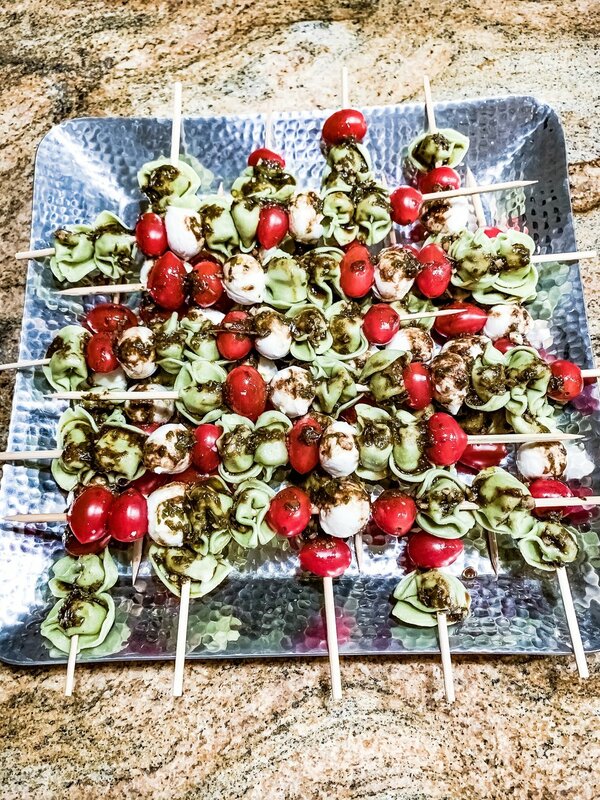 This year I tried a holiday color themed tortellini skewer recipe. For recipe click her to see the post. 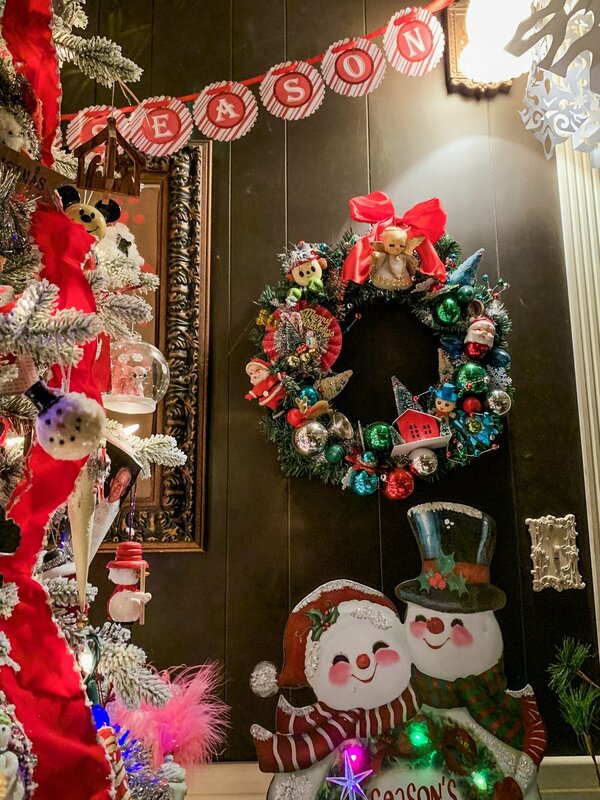 The Party itself is a Christmas wonderland and here is a photo view into how amazing our annual Christmas bunko really is. 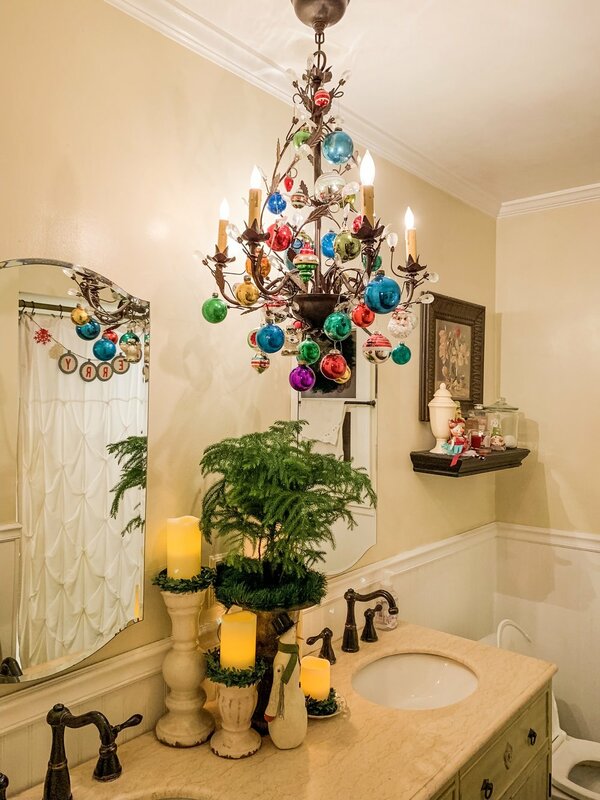 Kathy goes all out and truly loves this holiday and it shows. Another year and memories. Until the next Christmas Bunko we continue to Be Awesome and Sparkle.